In the first blog of this series, we configured our Apache Web Server. Our next step will be to set up request forwarding to send traffic to Payara Server. 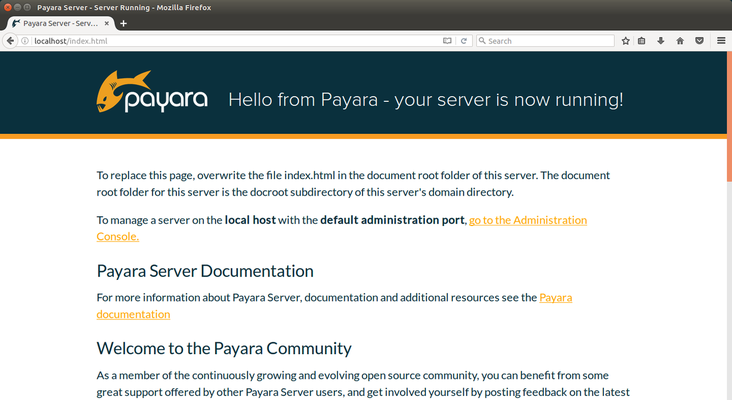 If you need guidance on installing Payara Server on Ubuntu, we already have a blog post covering the installation of a JDK and Payara Server which we would recommend you read before continuing with this blog. Request forwarding (or proxying) is where a server receiving web traffic sends it on to another destination. These can be used to hide a users real location, to keep internal systems from view, or to manage performance. As with most web servers, Apache Web Server can be extended with modules which give it the ability to forward requests to a server, and proxy the responses. This means that you can use Apache as an intermediary which saves the trouble of specifying port numbers or precise IPs and lets the user receive responses from the same server (rather than clicking on http://localhost and having the address bar read http://localhost:8080). How can I set up request forwarding between Apache Web Server and Payara Server? Note that earlier version of Ubuntu will use "apt-get" in place of "apt" in Ubuntu 16.04 and above. If you wanted to disable a module, there is a companion tool to a2enmod called a2dismod which is used in the same way. As you can see from the terminal output, the tool has detected the dependency and has also enabled mod_proxy. If you had a series of modules you wanted to activate you can add them after proxy_http, separated by single spaces. 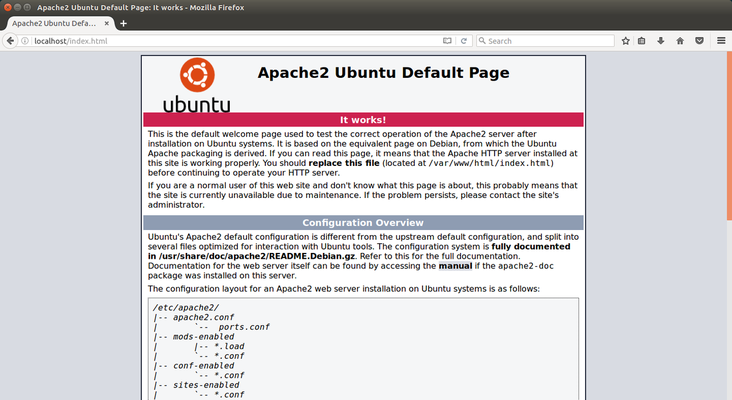 The apache2 package on Ubuntu has an example site configuration called "000-default". The configuration file for this site can be found in the folder /etc/apache2/sites-available and is symlinked to the sites-enabled folder. Generally, you will see internet guides refer to httpd.conf as the configuration file to edit. This is just the default "parent" configuration file. In Debian/Ubuntu systems (and their derivations, like Linux Mint), the file to look for is apache2.conf. This file is read, and its directives applied, from top to bottom, so if you have set the same property to two different values, the second will apply. (More accurately, they will both apply but the first will only apply until the second setting is read). This file can also specifically "include" files and folders (where any *.conf file in an included folder will be included). These will be read in and merged with the main configuration at the point where the "include" statement is written. So the very last line in the main configuration file (if it is not specifying another file) will be the last line of configuration to be set, no matter what. The default page in a new installation for Apache in Ubuntu can be found in /var/www/index.html and gives a good overview of how this works in detail. Because we will need to add in some specific behaviour, we will not be using the default configuration. Copy the old configuration from sites-available and rename it something memorable. The <VirtualHost> element contains a series of directives which tell the server how to respond to the listed incoming requests. In this example, <VirtualHost *:80> handles all responses arriving at the server on port 80. 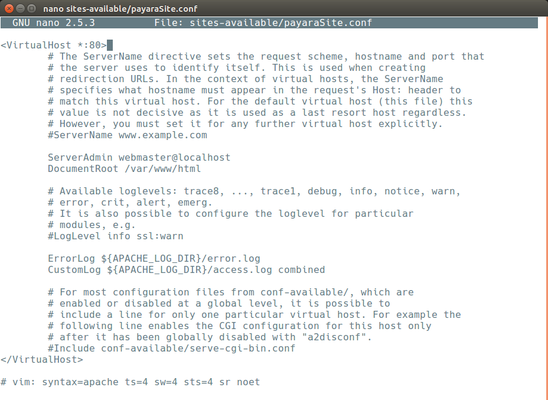 For a more detailed explanation of the VirtualHost tags see the Apache documentation. This directive tells Apache to send everything after the server domain name to http://localhost:8080, as though the user had gone directly to that URL. This directive tells Apache to reverse proxy the URL so that, although the response comes back from the Payara Server instance on port 8080, the URL looks like it has come from Apache. These two directives, when used together, mean we can avoid complicated regular expressions with mod_rewrite. Assuming the domain name we want to use is, for example, www.example.com, our configuration means that a request to www.example.com/myapp would actually be sent to the Payara Server as though the user had directly accessed www.localhost:8080/myapp. So we now have an active Apache HTTP Server acting as our proxy (with the potential to add further modules), and a working Payara Server ready to have applications added to it. 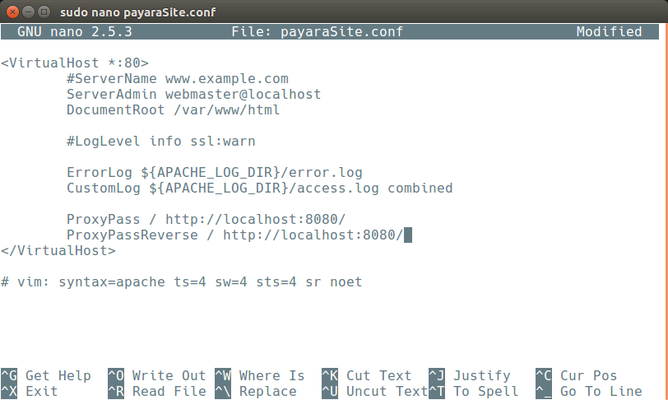 We've gone through installing both servers, configuring Apache, exploring the file system, and had a very brief look at Payara Server's asadmin commands. In the next blog we will be looking at how we extend the functionality of both Apache and Payara Server; looking at how we can get Payara Server to allow for scalability and further enhancements we can add to Apache to handle multiple back-end servers. If you have any questions about this blog, or Payara in general, feel free to post a comment below or join the discussion on the Payara Forum.